The 7th on Streamsong Blue offers a picture-perfect setting. GOLF just released its latest edition of the Top 100 You Can Play, and Streamsong Golf Resort is one of the big winners. For the first time, the Red course (designed by Bill Coore/Ben Crenshaw) enters the top 10, jumping up two spots to No. 10. The Blue course (designed by Tom Doak) also moves up two spots to No. 14. 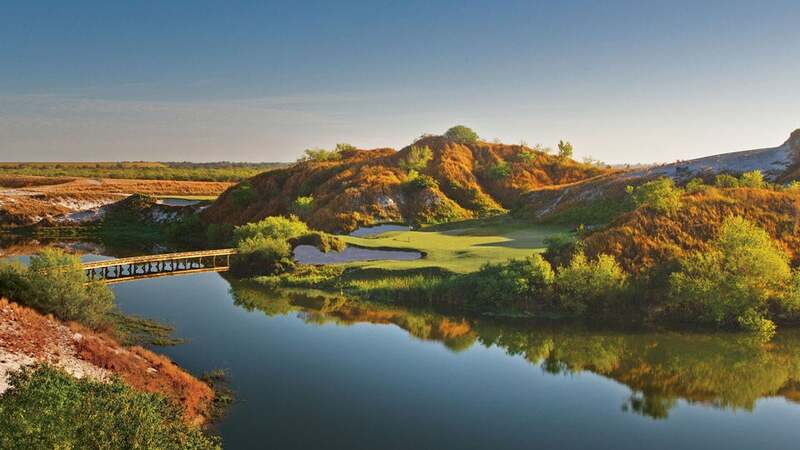 Outside of Bandon Dunes, Streamsong owns the highest-rated tandem of public courses in the United States. If Streamsong has been on your bucket list for a while, this guide will help turn your fantasy into reality. As public-access, two-course complexes go, there’s none better in the United States than Streamsong. It took just three years for this tandem to reach the top, for reasons that are immediately evident. Play the first hole on either course and you know you’re in for a special treat. Perhaps the most enjoyable exercise of all, however, is to settle the grill room debate: Which course is better, the Red or the Blue? My fence-straddling response? It depends. Both the Blue and the Red were hewn from reclaimed phosphate mining land. The resulting sand base, gigantic, dune-like spoil piles and unusually rolling (for Florida) terrain yielded a terrific canvas for golf holes. Combine that with superintendent Rusty Mercer’s wizardry for getting Bermuda grass to play firm and fast, and you have links golf without an ocean. If some have given the Red a slight edge over the Blue, it’s due to the amped-up drama, with more forced carries, more demanding driving, more water in play and more holes framed by trees or sand. Greens have bolder, broader contours and sharper drop-offs. Yet the Blue impresses me even more, with its less-intrusive approach, where fairways and greens melt into the existing terrain, as if they’ve been there for generations. Superior interior green contouring defines the Blue, as does its softer, more varied green surrounds. Both courses are equally walkable—save for the heart-pumping climb to the first tee on the Blue, which at least yields a spectacular panorama of the property—and each possesses its share of individually memorable holes. Blue highlights include the wild, unique par-3 seventh that calls for a lake carry to an undulating green cocooned in the sandhills, the drivable par-4 13th, with its inspired fairway contouring and the outstanding par-5 17th, with its perfectly placed, risk/reward-inducing cross bunkering. The Red counters with the stern, stunning starting hole, with a drive over water and scrub and with an uphill trek past a massive white sand dune. Red also tosses in the long par-3 16th, which demands an aerial tee shot over water to a confoundingly contoured Biarritz green, bisected by a deep swale. We won't be able to pass final judgment on Streamsong's courses at least until 2017. That’s when Gil Hanse opens his Black course—and reignites the debate. From afar, the Lodge at Streamsong doesn’t look like it fits in with the rugged, sportsman feel of the resort, but you forget that notion once you step inside your room. It's decked out with floor-to-ceiling windows with river views, super comfortable beds, huge bathrooms, the works. You won’t have any complaints about the accommodations, except maybe that they are too nice given how little you’re in them. If you’re lucky, you can spent your weekend in one of the 12 guestrooms that sit on top of the clubhouse. That makes impromptu nine-hole loops as the sun sets more attainable. So the thing about Streamsong is, you’re in the middle of nowhere and you're working up a big appetite. The best bet for meals is to stay on the property, and there are plenty of options at your disposal. SottoTerra is the dubbed the flagship restaurant at Streamsong. Open for dinner Tuesday-Saturday, the menu meshes Italian offerings with steaks and seafood nicely, and since it’s located in the lower level of the Lodge, it feels like a separate restaurant experience. It’s best to make a reservation and throw on some nicer clothes other than the dirty golf shirt here. Fragmentary Blue is the spot for a night-cap. The bar sits on the top floor of the Lodge and is open until midnight each night. Local craft beer, cocktails and excellent bar food offerings are available in a spacious bar, complete with outdoor rotunda that offers a panorama view of the property. Restaurant Fifty-Nine is located at the clubhouse, and the large bar area and ample outdoor seating makes this the spot for post-round drinks or a quick bite between rounds. P2O5 is in the lobby of the Lodge and is the best spot to grab a quick breakfast before heading to the course. It’s also open for lunch and dinner and has a small bar area. You’re going to be eating most of your meals on the property, and the variety of options combined with the proper execution is a win for golfers. True, it’s in the middle of nowhere, but Streamsong is pretty simple to get to. From the Tampa airport, you’re looking at a 1 hour, 15 minute drive. From Orlando, it’s 1 hour, 30 minutes. The final 30 minutes you’ll begin to question if you made a wrong turn or if you’re still in Florida, until you see the small sign marked “Streamsong” that tells you you’ve arrived. If you take a 8 a.m. flight out of New York, you can be at the resort by 1:30 p.m. and be finishing an afternoon round before the sun sets. And once you’re on site, you don’t need a car. There are shuttles running both ways from the Lodge to the clubhouse all day. The two stellar courses are obviously the main draws at Streamsong, but there are plenty of options for those who choose to leave their sticks in the room for a day. In the bottom floor of the Lodge is the spa, Acqua Pietra. Massages, facials, mud wraps and peels are all on the menu. It’s a convenient option for the player who gracefully bows out of that afternoon round and wants to rejuvenate for the morning 18. For outdoorsmen, there are a bevy of options. Streamsong is one of the best spots in the state for bass fishing, and guided fishing in one of the surrounding lakes is offered. (Pricing: $100 for one hour, $200 for two hours, $80 for each hour after that). Sporting clays ($70 for 25 clays at a five-stand and $140 for 50 clays at an eight-station course) and archery sessions ($25 for six shots, $50 for 12 shots and $80 for 25 shots) are also available. We wouldn’t necessarily recommend it, but a weekend without golf clubs at Streamsong wouldn’t be unbearable. The cheapest time to head to Streamsong is the summertime. From July to September, Stay & Play packages start at $180/day, compared to $215-$360 the rest of the year. Not including a resort fee ($29) and caddie fee ($80-100 plus tip) if you decide to take one. The package includes one round of golf on the Red or the Blue course, one night at the Lodge or Clubhouse and breakfast. The tradeoff of going on the cheap is braving the brutal summer Florida sun. Temperatures will be in the 90s, and playing 36 holes wouldn’t be the easiest of tasks. For folks in the Northeast, Florida is a popular getaway in the brutal winter months. You'll pay a premium, though. A Stay & Play package for a weekend in January is $600/day. Another option: drive over for the day, play, then leave. The rates for public play on either course range from $125-$255 depending on the time of year. The cost is the same for both courses, and you get a slight reduction in price for being a resort guest. - Don’t have time for another full round? Try the six-hole loop. Both courses have their 6th green within walking distance back to the clubhouse. The course even supplies six-hole scorecards. The perfect place to break that pushed match from the morning. - The halfway shacks at both courses are sneaky good. In January, the Red course’s snack shack, next to the ninth tee, had barbeque and smoked sausage options, while the Blue’s shack on the 10th tee had three tacos to choose from. Both were standouts, and some of the best on-course food I’ve had. Quick, easy and delicious. - The practice facility is solid, if not spectacular. Located a short cart ride away from the clubhouse, there's a large chipping green with room for 20-yard pitch shots but not much more. The double-sided range is huge and never full. - Hosting a conference? There’s more than 24,000 square feet of meeting rooms for you to do so, along with ample outdoor event space. - Not sold yet? Here's a feature on Streamsong from back in 2013 by Sports Illustrated's Michael Bamberger to get your interest peaked even further. And a photo gallery from the course's grand opening. - Depending on which airport you choose, more rounds could be tacked on. The newly-restored Copperhead course at Innisbrook (home to PGA Tour's Valspar Championship) is only 30 minutes away from the Tampa airport. Arnold Palmer's Bay Hill and the New Course at Grand Cypress (Jack Nicklaus' St. Andrews homage) are both short drives away from Orlando's airport.